This tutorial was used in my Essential Cog layout. 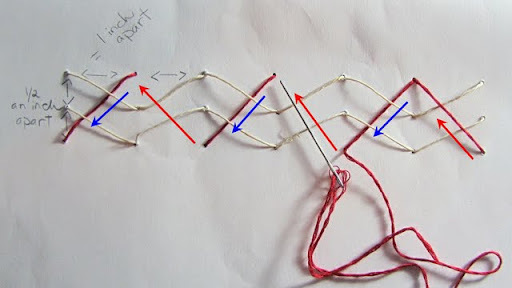 This stitch can be used straight or in a circular form. I think this is what makes this fairly large stitch unique--it can be used in a variety of ways. In a circle, straight at a slant--the choice is yours. This woven stitch came about by taking inspiration from two very talented women. One would be my scrap buddy Natasha who's love for lacing has made me look at this unique form of embellishing a layout with new eyes & who has also encouraged me to simply carry out the ideas that have been in my head for a very long time now. Thank you Natasha for the 'push' that I needed. Ok, let's get started. Your basic list of supplies consists of: a paper piercer, twine, ribbon, yarn, floss--anything you can use for weaving really--in my example I'm using twine-ruler & a pencil. With your ruler measure out an odd number of holes--as many as you need to complete your design. I found that odd numbers work best for this design. In my example I made the holes 1 inch apart. Take your pencil & make your marks. Next make two more sets of holes below the first set. The other 2 sets of holes are 1/2 an inch apart from the first set. When done, you should have 3 sets of holes as shown in the screen shot. Now take your paper piercer & puncture your holes. NOTE: From this step forward the red arrows represents the twine above the paper & the blue arrow represents the twine behind the paper. Start with the first hole & stitch diagonally. Go under the paper & come out in the next diagonal hole. I think my screen shot explains this better than me! Keep going until you reach the end. When you reach the end, simply backtrack & go in reverse. You'll know you're on the right track when you end up with a very wide v-shaped stitch as shown in my screen shot. When done with the first stitch--start the second one. You're going to begin with the second hole & repeat the steps from the first stitch. When doen with the second stitch--you'll end up with two parallel wide v-shaped stitches as shown in the screen shot. Finally you have your third stitch. It's the same process used as the first two except it's an even larger stitch & inversed. If you notice, you'll be creating an upside down v-shape. I used red floss here in order to make it stand out more. Start with your bottom third hole & stitch all the way to the top. For the first round of the stitch go under the first two stitches as shown in my screen shot. When done, go in reverse & go over the existing two stitches. Here you go! Simple as that. Now you can get very creative with this. You can use eyelets, you can use different colors for each stitch or you can combine different strings such as twine & ribbon. Hope you enjoyed today's tutorial & that you have fun creating!